Starscream stands prepared to activate his All-Spark, using the captured Autobots and Decepticon to power it. While it turns on it fails to function, because Dreadwing sabotaged it to seize power for himself. The Autobots may not be able to save their comrades but they take advantage of the power struggle and destroy the Decepticon base, the space bridge sending Starscream and Dreadwing to another planet where Starscream gets his revenge. Now his only hope is to gather the remaining Decepticon forces and begin again by taking over Earth. Sadly this doesn’t lead into the next movie but comics and novels would discuss events that could have happened after this, at least until the later movies made it all unlikely. What they got right: This was a good finale. The All-Spark being recreated would have impacted the movie universe so keeping it out, trying to guess what the next movies would attempt, makes sense. Also, this is kind of how the Decepticons operate, stabbing each other in the back in bids for power. The Autobots also get to do some damage, and had this been a lead-in to the movies I think it would have worked better than introducing The Fallen into the movieverse. What they got wrong: Not going in this direction and instead giving us the later movies. This story was far more interesting than anything the movie gave us, although I have high hopes for Bumblebee given the few reviews I’ve heard. Recommendation: This was actually a really good miniseries and it’s too bad the later movies make it unlikely. It’s worth checking out. I have to double-check my collection but I’m pretty sure this is the last movieverse Transformers comic I have to review, but there’s one last bit of unfinished business regarding Transformer comics, not including graphic novels I may look at for Scanning My Collection. With the Doctor Who comics ending soon as well I’m going to have to find two new series to go over and I only have one in mind currently. I still have time though. Stay turned to the Sunday comic/update posting and see what’s coming next. 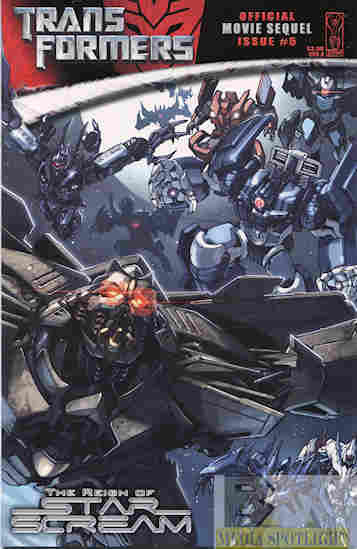 Posted by ShadowWing Tronix on January 3, 2019 in Movie Spotlight, Yesterday's Comics and tagged IDW Publishing, Starscream, Transformers (film series).